To raise funds to help pay for the Washington Trip, the team is having three fundraisers. Each option is a bit different and has different due dates so please read everything thoroughly. The total cost of the trip is $350. If your student-athlete raises more than $350 then the remaining funds raised will go towards the team. 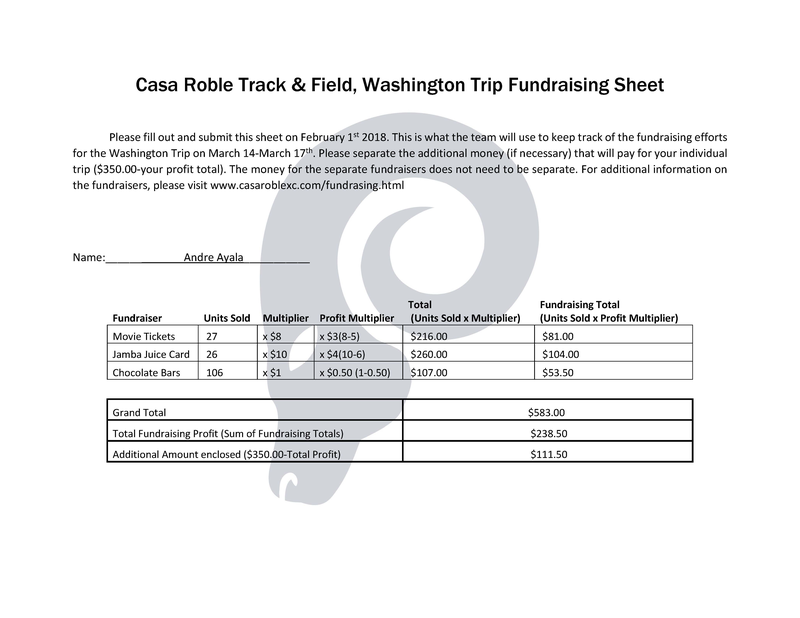 If your student-athlete exceeds the $350 mark and would like to attribute those funds to another student, please have that student submit those funds and fill out their fundraising sheet(attachment below) accordingly. This is to avoid any confusion when we calculate the total. This sheet will be submitted on Friday, February 1st. Description: Sell Tickets to Studio Movie Grill for $8 each (normally $12). Studio Movie Grill will give $3 back per ticket sold. The tickets can be used at any Studio Movie Grill and have no expiration date. They will work at anytime with the exception of movies advertised as "no passes". Payment: Annette Johnson will be in front of the Admin Office before school on Wednesday and Thursday from 7:30am-7:55am (12/13-12/14), as well as after school from 2:55pm-3:00pm on Wednesday the 13th to take orders collect money. Additionally, MaryAnne Povey will be able to take orders and collect money at the Booster Meeting on Wednesday evening. Distibution: Tickets will be distibuted on December 21st and 22nd. Questions: Text Annette Johnson,(916) 878-6744; MaryAnne Povey, 916-212-5711; or Amy Engle,(916) 719-0889. Description: Sell Jamba Juice Cards for $10 each. The cards have six Buy One/Get One Free uses. Jamba Juice will return $4 for every card sold. The cards have no expiration date and can be used at any Jamba Juice franchise with the exception of Express locations such as airports. Payment: Cards may be purchased upfront from Jennifer Rozumowicz. Distribution: Arrangements can be made with Jennifer Rozumowicz to meet at the school. They will also be available for purchase at the RamDeer Alumni Run on the morning of December 22nd. Description: Sell chocolate bars for $1.00 each. The team will initially purchase 50 boxes with each box containing 60 bars. If the team sells less than 50 boxes, we make a 40% profit, if we sell more than 50 the profit jumps to 60%. Jennifer Muthart is in the process of contacting local shops (Wal-mart, etc) to inquire about selling bars at the store front. More information of those coordinated efforts are to follow. Payment: The team is responsible for the chocolate boxes as soon as the box is opened. The team will purchase 50 boxes initially. Distribution: The chocolate will arrive the week of 12/17/18. Please download and print out the following attachment and turn it in on February 1st, 2019.